The nozzles of the three main engines and those of the two boosters are adjustable and are controlled by the onboard computer to adjust the flight path. There are many links on the net from which specifications and other information for the Shuttle and its components can be obtained. Example links are: System; Shuttle. The altitude of the ISS ranges from a minimum of about 278 km to a maximum of about 460 km. The normal maximum is about 425 km. Atmospheric resistance causes it to drop at a rate of ~ 2.5 km per month. 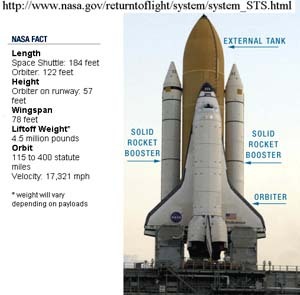 Shuttle missions are believed to often nudge it back up into orbit a bit when docked and when there is OMS fuel to spare. We require a numerical description of the orbit that is to be achieved. We chose an orbit with an apogee of ~304 km, a perigee ~300 km and an inclination of ~51.6 degrees. 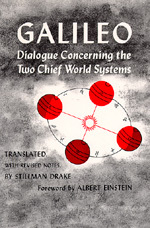 Keplerian orbital elements were explained in Topic 1 of Chapter 7. They can be used, when examining the trajectory of Orbiter, to characterize its motion in terms of instantaneous Keplerian orbital elements. The term instantaneous is used because the object is often under powered flight and the orbital elements are continually changing. 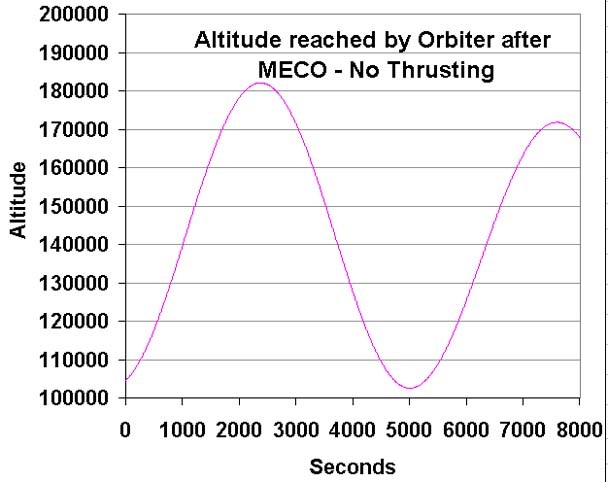 Adjusting the direction, duration and, at times the magnitude, of the thrust during powered flight is used to arrive at the desired orbit with the required orbital parameters. 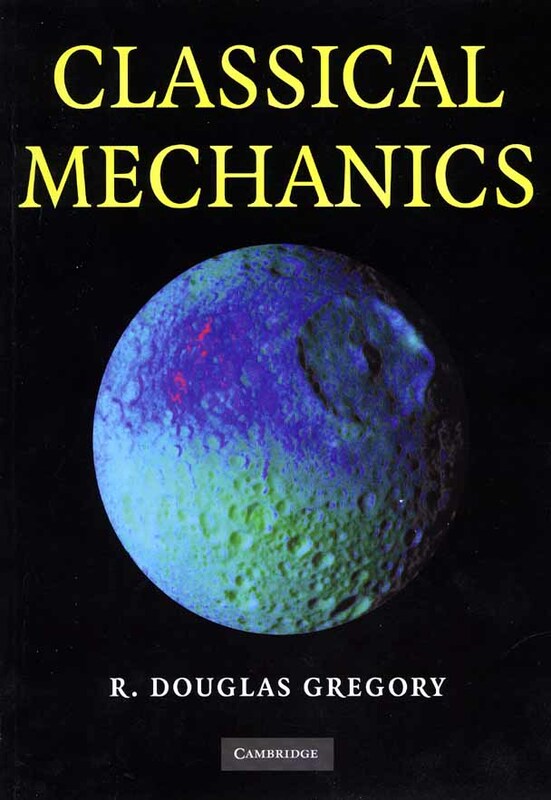 Our database for Orbiter's parameters at MECO was described in the final topic of Chapter 8. There the Latitude is given as 37.173, Longitude as -68.991, Altitude as 104,653.08 the Velocity as 7869.02 and the Azimuth of the velocity as 51.22. The Elevation of the Velocity was unknown but likely to be near zero. We chose 0.1 degrees. This Elevation was chosen simply because it was unlikely to be exactly zero. The mass of an Orbiter varies from mission to mission. We chose 104,328 kg. Not being aware of Orbiter's drag we guessed 1.0 as the value of the drag coefficient and estimated Orbiter's sphere equivalent radius as 3.5 metres. A step size of 0.01 seconds was chosen for the integration steps. Order 2 integration was employed. Without further thrusting Orbiter would crash to Earth. After reaching MECO and dropping the external fuel tank, Orbiter is left with two other sets of engines, the first referred to as OMS, the Orbital Maneuvering System consisting of two aft engines, the second as RCS for the Reaction Control System consisting of 44 nozzles. One of the two OMS engines can be seen in the second image of this topic. The OMS engines are used for the heavy work of getting into the desired orbit, meeting up with the ISS and for de-orbiting. The RCS is used for more delicate maneuvers such as are needed in changing Orbiter's orientation and in docking. An astronaut in earth orbit can look out the widow and see the earth. The visible size of the earth and its position in the window provides clues to the altitude of the orbit and to the orientation of his vehicle with respect to the tangent plane. 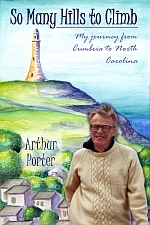 He may see sufficient surface features to identify a northerly direction and roughly the azimuth of his direction of his travel. If the earth appeared to receding over time then he would deduce that his velocity had an elevation component. 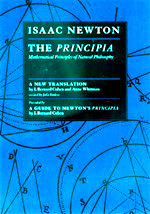 The foregoing considerations strongly suggest the view that the writers have taken, that commands to the Course Computer for control of the engines should call for thrusts directed at azimuth and elevation angles that are with respect to the current tangent plane. When an Input Table is added to the atmospheric model spreadsheet, its object is acted on further by the parameters of that table. The table could be thought of as the equivalent of Shuttle's on-board computer in providing direction to its thrust engines. Although an example application of the table is shown following, more is provided in this and the next topic about determining the values for its entries. Row two contains the initial values for t=0, Cd as 1.0, radius as 3.5 and mass as 104,328. In columns C and D, starting in Row three, there are Elevation and Azimuth values. These do not refer to the angles of a rocket's thrusters relative to its orientation but rather they are course or heading controls where the angles are with respect to the tangent plane and are taken as the heading in which the corresponding force is to be applied. We imagine that our rocket is equipped with a "State Computer" that employs an inertial guidance system plus a GPS-like system, that may include wireless signals from ground stations and from the ISS, so as to have good estimates of its Cartesian position and velocities at all times. The State Computer provides the evolving current state to the Course Computer, which in turn controls the angles of the rocket's thrusters so as to maintain a desired course. Force and heading instructions remain in effect until changed by a subsequent line of the input table. Heading is not controlled in an interval in which no force is applied. The angles of the thrusters can be changed when there is no thrust in anticipation of future thrusting. Input values can be placed in columns E, G and I and will override initial values if that is desired. The time values in column H are the cumulative times that the actions of the rows are in effect. Column I shows the calculated mass of the object in accord with its initial mass, its rate of mass loss per integration step as shown in column F and the number of integration steps as given in column A. A total of 180.97 seconds of the available 625 seconds of thrust were employed in this Input Table. The initial 30-second coast allowed for the time taken to separate from the main fuel tank. The first burn was used to increase the radial velocity such that Orbiter would coast to ISS altitude. Elevation was not employed because we presumed that thrusting at zero elevation would make the most efficient use of thrust. The second coast and burn served to circularize into ISS orbit and to arrive closely behind the Space Station. We think of the navigation process in terms of the functions of three computers, the first two of which have already been mentioned. There is a Course Computer that given a burn time, and a heading for the thrust relative to the tangent plane, controls the attitude of the gimbaled thrusters so as to maintain that heading over a given burn time. To carry out this function, the Course Computer must be informed regularly of Orbiter's ever-changing position, velocity and orientation. The State Computer provides that needed information. The State Computer is an adaptation of the Earthly GPS system, which is augmented by a regularly updated inertial system and by wireless data from Earth, satellites, and the ISS. This computer provides continuously updated position, velocity and orientation data regarding both Orbiter and the ISS. The Model Computer maintains regularly updated models of the atmosphere and Orbiter and its Engines. These models are employed to predict the path that will be taken by Orbiter resulting from a sequence of directed thrusts. This predicted path is compared with the path information received from the state computer to provide error values. The differences between the state values predicted for Orbiter from the models of the atmosphere and engines, and the achieved positions are regularly employed to update the models, which results in adjustments being made to values equivalent to those in rows 4:6 of our spreadsheet. (The actual duration and heading of a burn may change before that burn completes.) The total process is known as Adaptive Conditional Feedback Control. It is Conditional because the Adaptation of the models only occurs to the extent that achieved values depart from values predicted by the models. Although the spreadsheet model employs a constant burn force, we expect that in a real situation the force depicted would increase as the density of the atmosphere diminishes and would likely experience other changes during the ascent from MECO. Similarly, the rate of mass loss could change. The two OMS thrust engines can be operated individually or both at the same time. They have minimum burn times of two seconds. Their rate of swiveling is limited as is their range of swiveling. Should the OMS swiveling rate be insufficient or the range limits be reached, the Reaction Control System is brought into play to assist. At times the RCS may be employed solely to align the gimbaled thrusts with Orbiter's centre of gravity in readiness for a thrust command. 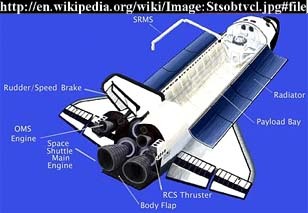 When the RCS is required, the Model Computer will provide the Course Computer with a vector of thrust values and their durations to be applied to a selection of the 44 RCS nozzles that surround the Orbiter. Such a vector can provide translation or rotation or both. The translation component will contribute to the path followed by Orbiter and that path is compared with the actual path as determined by information from the State Computer. The comparison allows for corrections to the vector of thrusts or may lead to further RCS commands. In some cases the rotation will need to be cancelled by a further command to the RCS nozzles. In other cases it may be maintained during a one-engine or two-engine OMS thrust as a measure to counter imbalanced engine thrust. Navigation Computers, Modeling and updating the models. The design and update of the sequence of Course Commands. Some navigation techniques.